This letter was written by 15 year-old John Warren Laughlin (1847-1863) of Co. F, 104th Illinois Regiment with his older brother Lemuel B. Laughlin (1839-1863). They were the sons of Thomas Williamson Laughlin (1813-1860) and Mary Bailey (1814-1896) of Bureau County, Illinois. 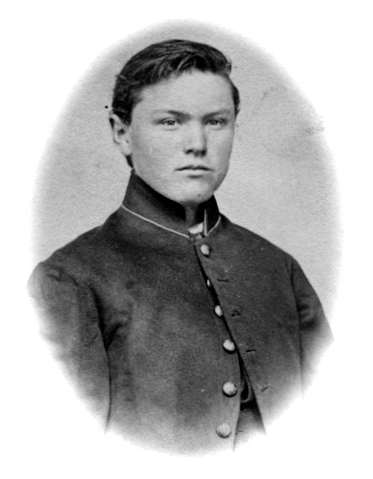 Warren Laughlin enlisted in the 104th Illinois on 14 August 1862. The regiment was rushed to Louisville in late August without having even been issued uniforms and arms; then was sent by railroad to Frankfort, Kentucky “in September” (no date given) where it was encamped until late October. The distance between Louisville and Frankfort via the railroad was 65 miles. Regrettably neither Lemuel nor Warren would survive the war. Lemuel was killed on 20 September 1863 during the Battle of Chickamauga and Warren died in a rebel field hospital on 29 September 1863 of wounds received in that same engagement. Warren was barely 16 years old. These brothers were two of the ten soldiers in the 104th Illinois that were killed or mortally wounded in Company F during the entire war. We boarded and arrived at our stopping place at the present. We arrived here on Sunday night [7 September] about seven o’clock. We then marched down to our camps one mile from Jefferson Mill in _____. The boys are all well. We have crackers so hard that we have to file our teeth but they are mighty good. We have in this camp five thousand men. There is within 5 miles of here 75 thousand men. You must excuse my bad spelling. Write some and tell me how the girls all get along. The girls down here are very independent. I have only about fifteen minutes to write this.